Pertaining to advertising during NFL games, advertisers pay TV networks for a guaranteed audience reach. If the games do not draw the ratings (audience) the advertisers paid for, the networks owe the advertisers a refund. OUCH! Such advertising refunds were commonplace last year, and no matter what other excuses the NFL dreamed up for the lower ratings/reduced audience, polling continued to prove the reason was Colin Kaepernick’s racist antics during the national anthem. 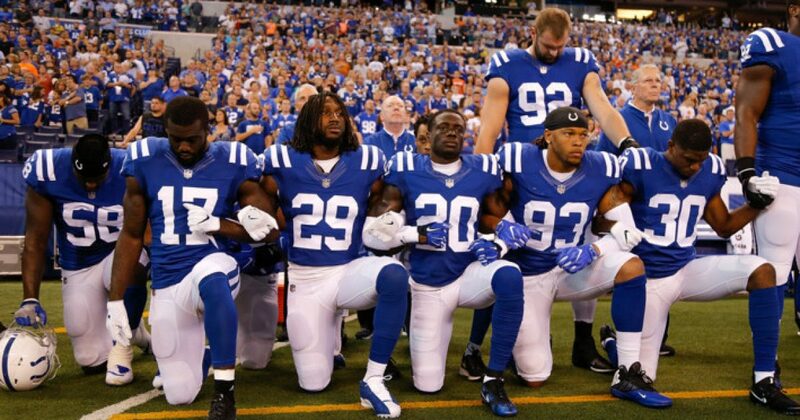 The refunds from the networks to the advertisers are continuing this season, and will likely get much larger with the firestorm that was created last Sunday when over 200 NFL players took a knee during the national anthem as an intended extension of the middle finger to President Trump for his comments critical of the anti-American and childish behavior of the kneeling crybabies. This proves that the best way to get the NFL owners’, front offices’, and players’ attention is to boycott. Don’t attend games, don’t watch them on TV or online. Don’t listen to them on the radio. Just stay away. They will get it. In my case, it is already too late. I will NEVER watch another NFL game, not even the Super Bowl, no matter what they do. Once you spit in my face, I don’t trust you or like you anymore, forever.